Surface of a Scott Thomas Furniture coffee table with Don Drumm metal work. 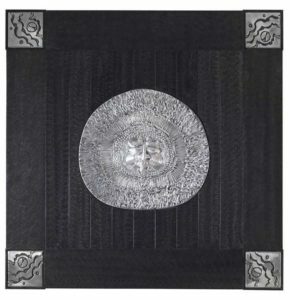 Rosemary Hamed, known in the area for her previous oriental rug business, has created a furniture line featuring Don Drumm’s art, which she will exhibit and sell at Summit Artspace on East Market for two upcoming weekends, May 25-26 and June 1-2. 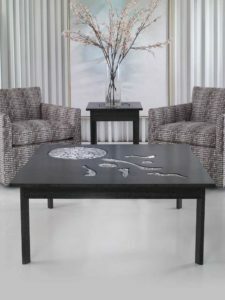 Don Drumm metal work pieces are integrated into the surfaces and design of Hamed’s contemporary coffee tables, end tables, credenzas and other furniture produced by Scott Thomas Furniture, an internationally-recognized furniture company headquartered in Akron. Hamed, who is the company founder and president, is calling her exhibit, When Art Joins Furniture. The exhibit will be in the Transition Gallery. Hours are May 25, 5-8 p.m.; May 26, 12-5 p.m.; June 1, 12-7 p.m.; and June 2, 12-9 p.m., which is also Artwalk in downtown Akron. Summit Artspace on East Market is located at 140 E. Market St., Akron. There is no admission charge. “I believe his work will be highly valued and will be with us through the decades if not centuries. 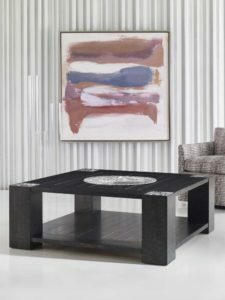 I consider it such a privilege to incorporate the talented work of Don Drumm into my furniture,” Hamed said.